Discover the signs that explore the area&apos;s automotive history. From the origins of R.E. Olds and REO Motor Car Company to the impact of developing neighborhoods, to the demise of an auto innovators home to make way for a freeway, it seems like every time you turn around in Lansing, you encounter a tie to the automotive history. Rolling Through the City | Located at 603 S. Washington Ave. The I-496 freeway loop opened in late 1970. 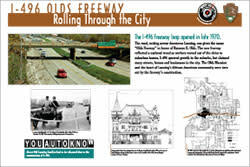 The road, cutting across downtown Lansing, was given the name "Olds Freeway" in honor of Ransom E. Olds. The new freeway reflected a national trend as workers moved out of the cities to suburban homes. I-496 spurred growth in the suburbs, but claimed many streets, homes and businesses in the city. The Olds Mansion and the heart of Lansing&apos;s African-American community were torn out by the freeway&apos;s construction. Lansing architect Darius Moon designed the home of Ransom and Metta Olds and it was built in 1904 on the corner of S. Washington Ave. and Main St. The Olds house was an L-shaped structure consisting of two and a half stories. The exterior walls were of buff-colored brick, trimmed with red sandstone. The hip roof was covered with green slate, and in the corners were towers; these were removed in 1952. The interior was impressive, with its paneled walls, its paneled or decorated ceilings, and its marquetry floors with three- and four- tone borders. One of the more notable features was a garage, more elaborate than modern day garages, that was a completely finished off and heated one thousand feet of floor space. Features included a vehicle turntable, which enabled Olds to drive outside without backing up his car! Living in an Auto Community | Located at 1126 S. Washington Ave.
It&apos;s all in the neighborhood. After leaving Oldsmobile in 1904, Ransom E. Olds formed a new company, using his initials to create the treasured "REO" name. The company bought the Baker Farm and built a new factory. Workers and their families came from Michigan farms and from as far away as Germany. REO soon became a leading automobile producer. The REO Motor Truck Company was formed in 1910, and production of the popular Speed Wagon soon began. REO offered the first practical automatic transmission in 1933; however, the Depression-era economy brought an end to car production in 1936. The company focused instead on commercial and military vehicles under the name REO Motors. Diamond T Trucks merged with REO in 1967, resulting in Diamond REO Trucks, Inc. The maker of "The World&apos;s Toughest Truck" closed in 1975. Despite its designation as a National Historic Landmark, the plant was razed in 1979 to make way for new industry. Built in 1917, the REO Clubhouse was the cultural and recreational hub of Lansing, hosting free movies, wedding receptions, basketball games, dress balls and patriotic gatherings during the First and Second World Wars. Workers relaxed at the REO Clubhouse, read the REO Spirit and patronized local stores and churches. The clubhouse was also the home of Lansing&apos;s first radio station, WREO, which went on the air in 1921. Known as the "Temple of Leisure," the building comprised a two thousand-person capacity dining room, an auditorium, a library, four bowling alleys, a fireproof movie booth, and smoking, lounging and billiard rooms. Use of the clubhouse by employees was one of the policies implemented by REO to cultivate the loyalty of its workers. Years after the Diamond REO plant closed in 1975, former employees recalled the sense of family fostered by the company. The clubhouse was razed in 1979. The commercial and residential neighborhoods surrounding the plant became know as "REO City." Away from the Smoke and Dirt | Located at 629 N. Jenison Ave.
"Home Owning is City&apos;s Slogan"
In 1916, what is now the Westside Neighborhood began growing out of the farmland west of the State Capitol. The Espanore and Westmoreland subdivisions targeted professionals and managers who worked in the booming auto industry. City leaders, who saw home ownership as key to community stability, embraced the new subdivisions. In support of the city&apos;s 1919 home ownership campaign, the children in all 18 Lansing schools wrote essays entitled "Why you should own your own home." 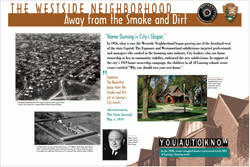 The first owners of the Westside Neighborhood homes were doctors, lawyers, bankers, administrators and auto industry managers. But the area did not shy away from the factories for long. In 1921, William C. Durant, former head of General Motors, launched the Durant Motor Company and built his factory just west of the new subdivision, drawing more people to the neighborhood. 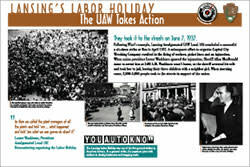 The UAW Takes Action | Located at 100 N. Grand Ave.
A significant movement in Lansing Labor history stopped traffic for an entire day from the Frandor Area down to the Capitol on June 7, 1937. Records show Lansing Sheriff Allan MacDonald arrested Mrs. Lester Washburn, wife of the President of the Amalgamated Local 182 of the Allied Industrial Workers. The officer had intended to arrest Mr. Washburn, but since he was away on union business at the time, they arrested his wife. Prior to the arrest the telephone wires leading into the house were also cut so that no one could call for help. The Washburn&apos;s three children were left alone at home in the middle of the night. The arrest was prompted by union organizing efforts at the Capital City Wrecking Company. The company had notified the Sheriff&apos;s office and all union leaders were arrested in a nighttime sweep. The workers were outraged by the actions of the Sheriff&apos;s department. The following day President Washburn issued a statement, "In celebration of Sheriff MacDonald&apos;s bravery, the workers of Lansing have called a ‘Labor Holiday&apos; so that the world will never forget his courage." Twelve thousand workers staged a non-violent strike by blocking traffic with their automobiles on Michigan Avenue, effectively limiting commerce for an entire day. Industry by the River | Located at 1200 Turner St. This neighborhood specialized in making tools. 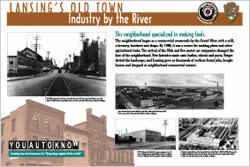 The neighborhood began as a commercial crossroads by the Grand River with a mill, a brewery, butchers and shops. By 1900, it was a center for making plows and other agricultural tools. 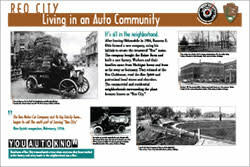 The arrival of the Olds and REO motor car companies changed the face of the neighborhood. New factories made auto bodies, wheels and parts. 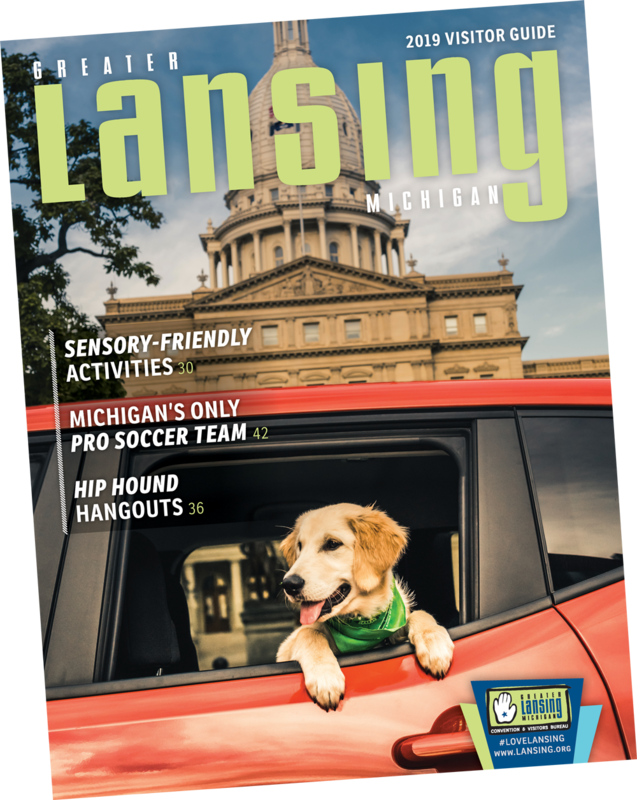 Forges dotted the landscape, and Lansing grew as thousands of workers foundjobs, bought homes and shopped at neighborhood commercial centers. Engines Turning Wheels | Located at 401 River St. 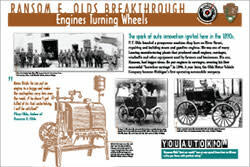 The spark of auto innovation ignited here in the 1890&apos;s. P.F. Olds founded a prosperous machine shop here on River Street, repairing and building steam and gasoline engines. His was one of many Lansing manufacturing plants that produced small engines, carriages, windmills and other equipment used by farmers and businesses. His son, Ransom, had bigger ideas. He put engines in carriages, creating his first successful "horseless carriage" in 1896. A year later, the Olds Motor Vehicle Company became Michigan&apos;s first operating automobile company. Fire didn&apos;t destroy Ransom E. Olds&apos; dreams. After fire destroyed the new Olds Motor Works plant in Detroit on March 9, 1901, the Lansing Business Men&apos;s Association offered Olds land acquired in hopes of permanently hosting the State Fair. He took it. His new plant produced only the curved dash runabout, the first car to be called "Oldsmobile." In 1904, Ransom Olds left the company, and in 1908 the company merged with General Motors. 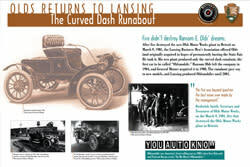 The runabout gave way to new models, but Lansing produced Oldsmobiles until 2001. MotorCities is the recipient of a grant from the Federal Highway Administration, Department of Transportation through the Michigan Department of Transportation and the Michigan Department of History, Arts and Libraries. The grant is for the creation of a Wayside Exhibit program in the MotorCities region. 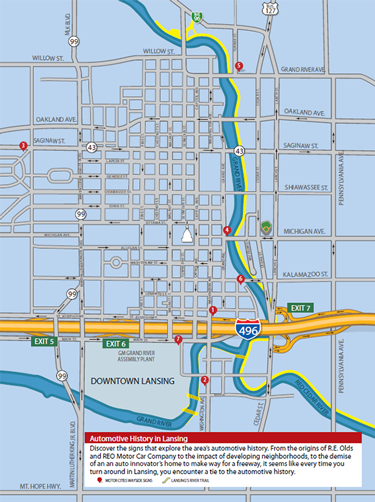 Over the course of three years (2008-2010), the Wayside Exhibit program will create a comprehensive system of approximately 300 outdoor signs in communities throughout central and southeastern Michigan. Each sign will commemorate Michigan&apos;s automotive heritage and will increase public awareness of this on a community and regional level. Signs have been installed in Ypsilanti, Flint, Lansing and Middle Rouge. For an interactive map and more details goto the Motorcities.org website. 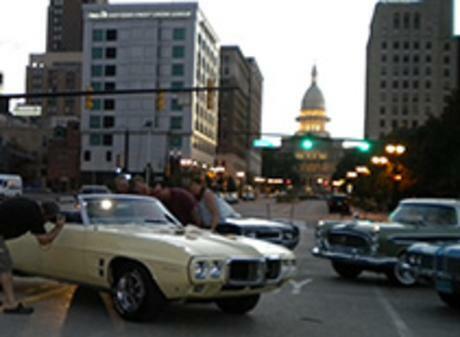 MotorCities National Heritage Area is an affiliate of the National Park Service dedicated to preserving, interpreting and promoting the automotive and labor heritage of the State of Michigan. National Heritage Areas are places where natural, cultural, historic and scenic resources combine to form a cohesive, nationally important landscape arising from patterns of human activity shaped by geography. Find them online at http://www.motorcities.org/.